Chania is the largest city of Crete after Heraklion which is the capital of the isle. 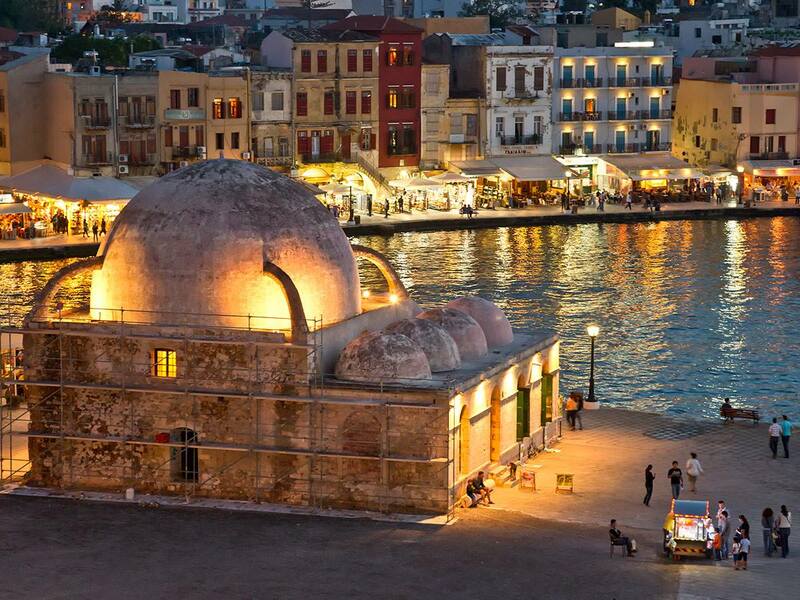 Chania is praised for its mystical atmosphere and beautiful harbor and its labyrinth of narrow alleys. The city is very popular among tourists and well known for its beauty. Built on the Minoan settlement called Kydonia, Chania became an important city-state during the Classical Period. Conquered by the Romans, the city kept changing hands until the end of the 19th century; ruled by the Byzantine Empire, the Arabs, the Venetians, the Ottoman Turks, Chania has been a melting pot, a meeting point where many cultures and civilizations came together. Chania has a very interesting and turbulent history. The city can best be described as a mixture of Turkish and Venetian elements. The port is surrounded by great Venetian houses. In ancient times was known as Chania Kydonia. Its strategic location, the city was often captured and recaptured. Best known is the conquest by the Arabs (in 828) and the Byzantines (in 961). Only in the 13th century the city was conquered by Venice and the city turned in a more like modern city we know. However, this capture was not without a struggle. The city became tangled in the piracy and had to be rebuilt regularly. 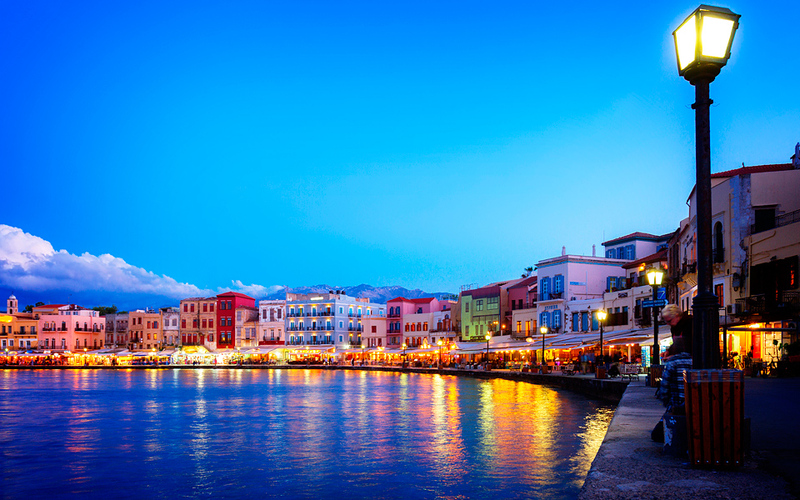 Early of 17th century became Chania, lost its independence and the city was proclaimed capital of Crete (until 1971). The second world-war was not passed by this town. Chania faced heavy bombing. The brutal German bombings in 1941 left many scars in the city’s pretty face, but Chania managed to heal and recover. A run along the quay insurmountable leads to a visit to one of the numerous restaurants, all of which are doing their best to seduce you. When it gets windy, the waves are higher, then you risk wet feet during dinner … seawater flows sometimes so into the restaurant. Behind the harbor up the narrow alleys you will face with numerous shops. However, these shops tend to focus on tourists, so no shortage of souvenirs. To what extent do appreciate that it is time to every man for himself. For the authentic Cretan atmosphere is worth a visit to the indoor market as well. Among the souvenir shops are here and there real Cretan merchants. Furthermore, the archaeological museum and a visit to the lighthouse in the fort Firkas is a must. A walk to the lighthouse is recommended. It offers a nice view over the city and the sea. Right between the snow peaked White Mountains and the deep blue of the Cretan Sea, lies the city of Chania. In its cobbled alleys, the Venetian mansions come face to face with the Turkish konaks. The catholic cloisters stand by the elaborate minarets. The ancient ruins coexist with the modern apartment buildings. 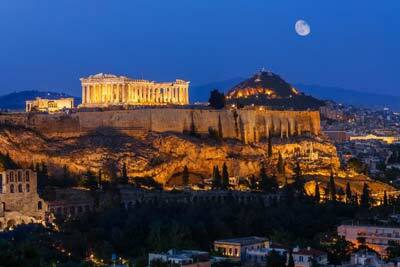 Greeks, Saracens, Venetians, Turks, Egyptians, British, all passed through the city over the ages. 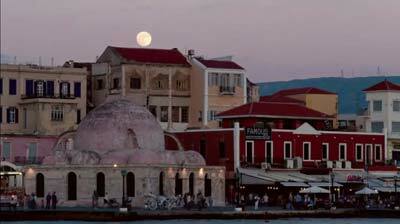 Their tales, many of which were written with blood, make up Chania’s spectacular history. The city speaks by itself. Start walking and the whole story will start unfolding before your eyes. Every step unravels a different facet of this colorful, sophisticated and multifaceted city. The paved coast by the Venetian castle, the mosques, the Venetian lighthouse, the narrow streets, the flavours of the Cretan cuisine; these are some of the things that will make you fall in love with Chania. Start your day early, with a walk around Topanas. It is the aristocratic quarter of the Old City, named after the “topia”, the canons that where installed on the ramparts of San Salvator by the Turks. On the north-western part you will find the Venetian port of Chania, as well as the Firkas fort, that dates back to 1629. A starting point is Firkas Fort, at the western part of town. Cruise down the jetty and climb the steps leading to the maze-like alleys with the Venetian mansions. Most of these are turned into hotels and lodges, offering incredible views at the port. Peaking through the windows of an abandoned stone building, you’ll see a domed ceiling full of skylights; the Turkish hammam (steam bath) hasn’t been running for ages, but a restaurant now serves delicious Cretan dishes right in the middle of the old cistern. If this increased your appetite, take Mousouron St. and head to the town’s Municipal Market. Inaugurated in 1913, the Market was built in the dike of the city’s old walls. Housing more than eighty stores, the Market offers an endless display of Crete’s purest products; fresh goat cheese, gruyere, snails, thyme honey, olives, wine, raki and the widest range of herbs you have ever seen! The very best the land of Crete has to offer, is all crammed here, waiting to be discovered. Giali Tzami, another landmark of Chania, is waiting on the waterfront. This Muslim mosque is preserved in an almost perfect state, reminding the times when the imam used to call for prayer. The imposing dome, surrounded by six smaller ones, sits on five stone arches. The mosque is a beautiful example of Ottoman architecture and today is a favorite meeting point. Further down the waterfront, the Venetian shipyards stand proud and tall. Eight out of the seventeen Venetian stone buildings survive up to date, giving this part of the port a unique feel. Today the buildings have become the city’s cultural hub, hosting art exhibitions and numerous cultural events. Next to it, the Marine Museum of Chania, featuring ship models from ancient times to the present day, as well as relics of historic Greek navy battles. 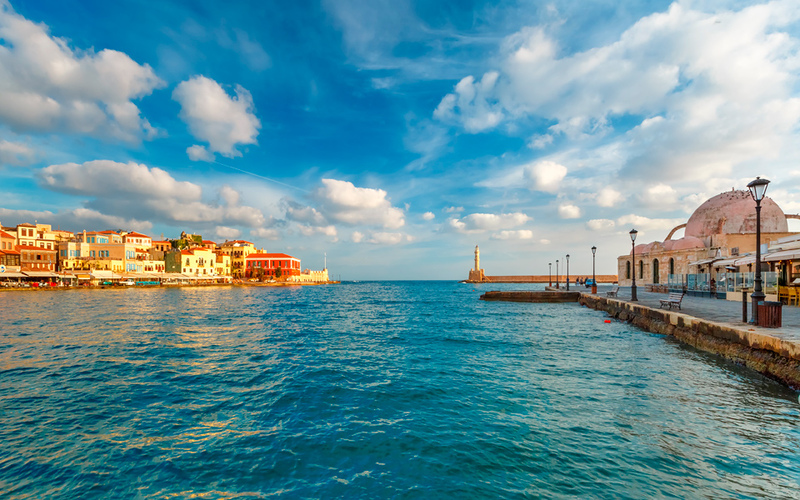 On the other side of the port lies the recently renovated 16th century Venetian lighthouse, a famous landmark of Chania, that was given the form it has today by the Egyptians on the 18th century. On the right side of the port stands the Kioutsouk Hassan Mosque or Giali Tzamissi. It stands out for its hemispheric dome, and today hosts interesting cultural exhibitions. Leaving the port, on the south of Topanas, you will find the Jewish quarter with the big Venetian church of Aghios Fragiskos, which currently houses the Archaeological Museum of Chania (21 Chalidon str.). Spend some time in the museum and observe important findings from digs around the area of Chania and the entire western Crete, dating back from the Neolithic to the Roman eras. Continue your walk towards the cross- shaped Municipal Market: its 76 stores are located in clusters on the four sides of the cross-shaped area. The Municipal Garden of Chania, Reouf Pasha’s pet project, is also nearby. It was designed in 1870 based on European designs. In the garden you can also find a historic coffee shop, a library, an outdoor movie theater, as well as the Garden Clock, constructed in 1924. Don’t miss the historic district of Halepa, where former Greek Prime Minister Eleftherios Venizelos used to live. His house is now the Eleftherios Venizelos Institute. Across the street is the church of Aghia Magdalene. It was built between 1901 and 1903 by Prince George, the consul of Crete, in an unmistakable Russian style. The biggest temple of Chania, the church of Evangelistria is close by. It is cross-shaped with an impressive dome and many neoclassic elements. It was the first cement-built temple in Crete. Also worth visiting: The old Tambakaria (tanneries). Today, the area is a major hot spot for gourmands who love fresh fish and everything the local cuisine has to offer. After nightfall, the heart of the city beats at the Kum Kapi district, outside the eastern Venetian walls, near the sandy beach. During the last years of the Turkish occupation, there was a small village situated in the area, where Arabs called Chalikoutes used to live in huts and work harbor jobs that were beneath the locals. The area was called Kum Kapisi (Gate of the Sand), named after the Venetian gate that exists there. Outside the walls, the road will lead you to the Aghia Triada Monastery, that was allegedly built by brothers Jeremiah and Laurentius Jacarolo, members of an important Venetian-Cretan family with influence over the local Orthodox as well as the Venetian Catholic population. Also visit the Gouvernetos –or Lady of the Angels– Monastery, 260 meters above sea level. Built in 1537 by the monks of the Catholics Monastery who were driven away by piracy, it is one of the oldest monasteries in Crete. Resembling a Venetian fort, it has four towers, one on each corner, and places for embrasures. Its 50 cells are spread over the two stories and are quite impressive. Coming back to the city, you must make a stop to the graves of the Venizelos family. On the same site you will also find the temple of Profitis Elias, and the monument for Kagiales, the Cretan who held the Cretan flag high when the spar was destroyed by hostile fire. No matter which route you follow around the narrow streets of the city, one thing is certain: You will gather some astonishing images, live amazing experiences and create memories you will cherish forever. The old Venetian lighthouse at the end of the jetty welcomes the sea breeze coming from the Cretan Sea. As the night falls, the city becomes luminous and bright. The volume is pumped up, the traffic peaks and the taverns start to fill. The famous Cretan cuisine is worshipped in the restaurants around the port, offering unforgettable culinary experiences. 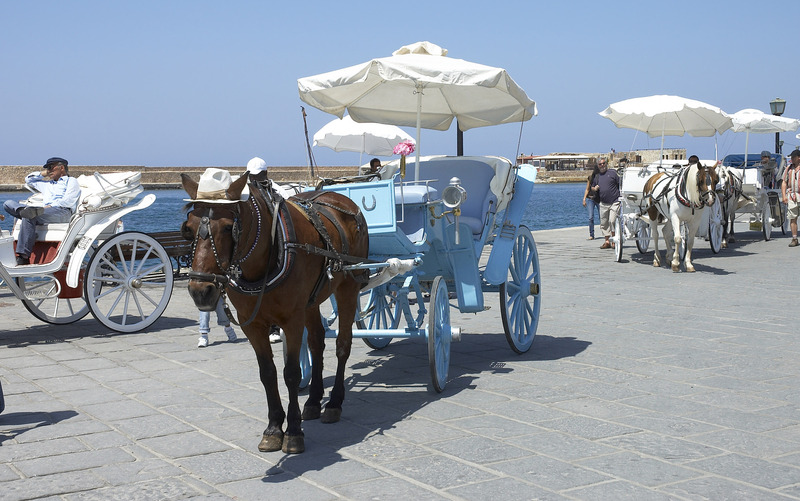 After thousands of years of continuous habitation, Chania continues to thrive. Beautiful and dangerously seductive, Chania is way more than a gateway to Crete’s pristine beaches. It’s an enthralling destination, an exciting cosmopolitan city, a captivating place to be.